DYNAMOS are facing a $2 000 fine from the Premier Soccer League (PSL), after their supporters threw missiles on to the field of play in their team's chaotic 1-1 draw with Yadah FC at Rufaro Stadium on Sunday. The Harare giants are going through their worst possible form and their draw was their only third point from a possible 18 this season. 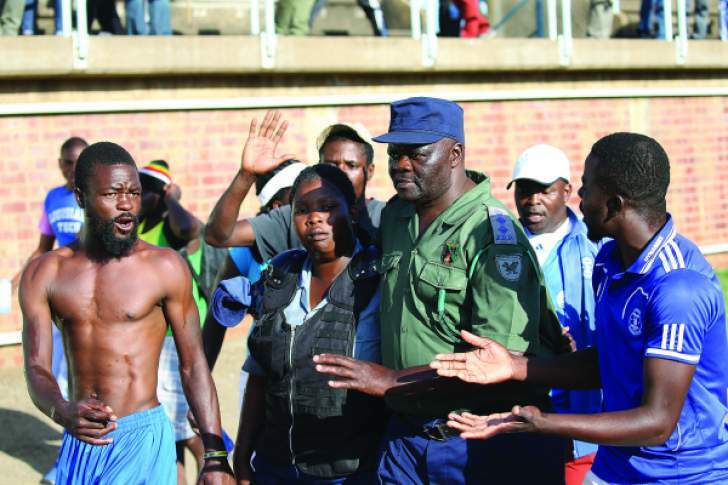 Their woes are set to mount when the PSL considers the transgressions of the Harare giants' fans during the feisty encounter, which saw Yadah finishing with 10 men after their captain Jimmy Dzingai was red-carded for idiotically returning missiles to the crowd. The club was fined the same amount for a similar offence last season. According to the PSL's Standing Order and Fines, missile throwing by fans attracts a $2 000 fine for the club. DeMbare supporters started raining missiles on to the field in the first half, protesting a throw-in decision that had gone against their team. That incident would set the tone for the rest of the match, causing countless stoppages during the course. The situation degenerated into chaos during the half-time break when an police officer unintentionally discharged a teargas canister, and the supporters responded by pelting the law enforcement agents with various objects and running battles ensued. Feeling cornered, the officers detonated another canister to try and disperse the crowd, and the fans scurried for cover, with some seeking safety in the confines of the playing field, forcing a delay in the restart of the match by 15 minutes. Yadah players' delaying tactics, in particular goalkeeper Steven Chimusoro, irked the home supporters even more, and they would throw objects in his direction every time he went down. There was a long break of almost five minutes in the second half, as the match officials battled to control the fans, and during that time, Dzingai appeared to be losing his head, and returned a water bottle that had been thrown his way. He was shown a straight red, and could be further sanctioned by the PSL for his troubles. Sadly, the chaotic events overshadowed the brilliant goals that were scored on the day. Exciting winger Leeroy Mavhunga got Yadah FC in front with a brilliant goal when he collected the ball outside his team's box, before accelerating into the Dynamos area, leaving Ocean Mushure and Godfrey Mukambi for dead in the process. He passed the ball to Simba Sithole, who knocked the ball down back for the winger to smash home first time, for a truly beautiful goal. Kuda Kumwala's equaliser was equally gorgeous. The striker, often maligned by his own supporters, received the ball with his back on goal, before making a sharp turn to unleash a bullet shot that went through Chimusoro's hands.